The all new Mainstage is a pre-configured entry level kit that includes drums, pedals, hardware, cymbals and even a throne. 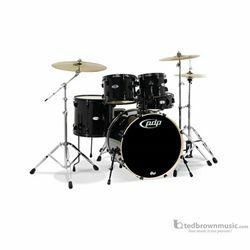 Mainstage drums feature hardwood construction in one of three durable wrap finishes: Black Metallic, Bronze Metallic and White. A set of Paiste 101 cymbals and a medium-weight hardware pack complete the rig. With everything in one package, PDP’s Mainstage Kit is an excellent choice for beginning players everywhere.